With the cutoff for semi-final qualification fast approaching, PSL Round Seven saw a number of ties which were crucial to clubs’ hopes of staying in contention for the playoffs, and a number of commensurately close finishes – in fact four of the six matches went down to the decider! 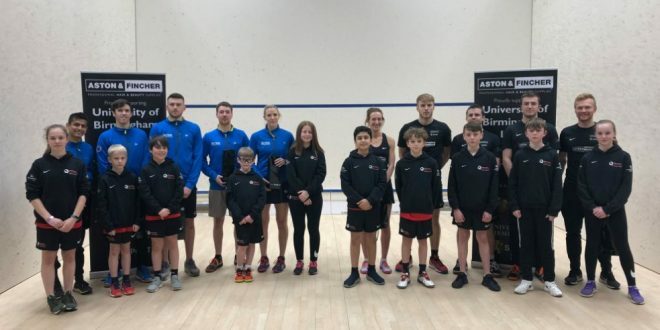 In Group A runaway leaders Duffield kept their unbeaten record intact thanks to wins by their lower order players, triumphing 3-2 at home to Pontefract. Meanwhile mid-table Nottingham and Chapel Allerton met, both knowing that only a good win was likely to give them a chance of challenging for second place. After a good start for the hosts Chapel A struck back to force a decider, but momentum swung a final time as Alan Clyne beat Ong Beng Hee to claim a valuable win for hosts Nottingham. Oxford started the night in second place and stayed there thanks to their 3-2 win at home to Birmingham University, Ben Coleman winning the decider against Jaymie Haycocks. In Group B it was all or nothing for two-time finalists St George’s as they hosted leaders Exeter, but it was the west country outfit who went home with the spoils, a 3-2 win keeping them top while surely ending St George’s faint playoff hopes, despite Daryl Selby’s 3-2 win over LJ Anjema to make the score respectable for the home side. Chichester and reigning champions Surrey, tied just nine points behind Exeter, played out a thriller which went down to the wire. Surrey were looking good with a 2-1 lead and Karim Abdel Gawad 2-0 up, but Robbie Temple made a fine comeback to tie the match and set up a decider. It was left to Adrian Grant to keep the title holders on course with a 3-0 win over Jon Kemp. In the bottom of the table clash Winchester came away from Bristol with the spoils, completing a 1-4 win that was the most comprehensive of the night.